Use this code to save $15 off your order of 24 or more items from DesignAShirt. Save $25 when you buy 36 or more items from DesignAShirt today! Buy more, save more with up to 30% off bulk buys from DesignAShirt. Save $5 off your customized item with this coupon code from DesignAShirt. 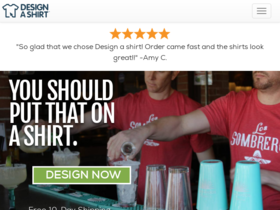 Enjoy free 10-day shipping on every order from DesignAShirt.com. Check out DesignAShirt online for their latest special offers.